Holland Condon is an established and progressive law firm, attuned to the demands of individuals, business managers and companies in an era of intense competition and ever-changing goals. As a law firm with a modern approach, we are driven by the needs of our clients and our close relationship with our clients is based on the extensive skills of our solicitors, legal executives and secretaries. We have a solid commitment to personal attention and persistent follow- through on behalf of our clients. We look at every situation from our clients’ perspective to ensure that they get the right advice and so as to achieve the best possible result. The firm was established by Kevin G.Keohane in 1941 and has been providing legal services for over 75 years. This law firm is regulated in its business and audited by the Law Society of Ireland - the statutory body governing solicitors. The firm is bonded and holds professional indemnity insurance in respect of each and every matter that we advise on. You can trust us with your dealings. Michael was born in 1954 and holds an honours B.C.L degree from University College Dublin. He was admitted to the Roll of Solicitors in Ireland in 1977. Before purchasing the practice, he worked with Robert Pierse & Associates, Solicitors, Listowel, Co.Kerry. In 1980, he purchased the firm from Mr.K.G. Keohane and the firm became known as Keohane Condon & Co. He has lectured extensively on all areas of the law to various organisations in the South East. He is a past President of the Kilkenny Solicitors Bar Association and past Chairman of Kilkenny City Fine Gael. His interests include politics, economics, golf and tennis. Michael specialises in property, family, probate and general legal matters. 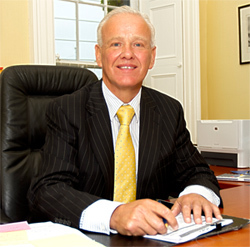 John holds an honours B.C.L degree from University College Dublin and a B.B.S degree (I.P.A.) together with a diploma in Applied European Law. 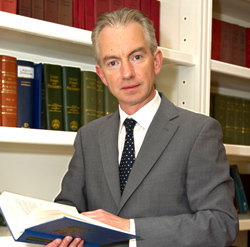 He was admitted to the Roll of Irish Solicitors in 1992. He has been tutor and lecturer on a number of academic courses, including Business Studies Law Course (I.P.A) and Business Law (IATI). John became a partner in the firm in 1997, at which stage the firm became known as Holland Condon. John specialises in litigation, accident claims, wills and business law matters.